Soo Lock Boat Tours | Downtown Sault Ste. Marie, Michigan! 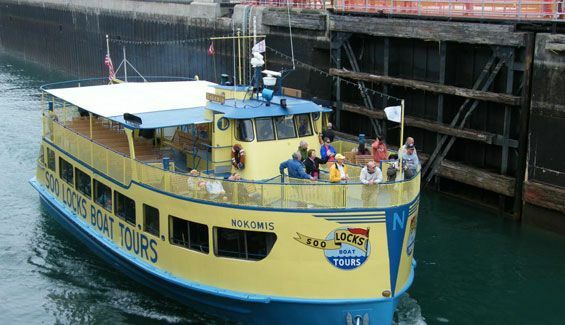 Experience “locking through” the Soo Locks in Historic Sault Ste. Marie, Michigan aboard the Soo Locks Boat Tours. Enjoy a relaxing narrated cruise on the St. Mary’s River and sight-seeing in the Sugar Island North Channel as you enjoy a delicious buffet style dinner. After dinner you will “lock through” the Soo Locks. The narrator will explain all the interesting sights along the two water waterfronts of Sault Ste Marie, Michigan and Ontario, Canada. While on the Upper St. Mary’s River, you will enjoy a delightful dessert. The Soo Locks Tour is an experience to remember. You will actually ride through the Soo Locks, quite possibly right alongside a big ship. It is a maritime adventure that’s educational and a lot of fun. Book your tickets on line today!